Just a quick update as most of today needs to be spent getting Jamie packed up and ready to fly back down to Florida later this evening but I wanted to post two of my favorite pictures from our trip to New York City yesterday and just say that we had a great time though we didn't get to do everything we wanted to do - naturally! Biking through Central Park was both fun and frustrating as, New Yorkers being New Yorkers, people don't hesitate to walk right in front of you even if you're coming at them on a bicycle! Having not been on a bike in well over 20 years it was a little tricky at first but then it was just like riding a bike! We got to see a lot of the things in the park but missed a few. Guess that means another trip is in order at some point! Walking across the Brooklyn Bridge was quite the experience and a lot of fun, too. We couldn't have had better weather if we had custom-ordered it! If I ever do this again, though, I want to try it at night just to see the lights of the city and the bridge. If you ever get to New York, I highly recommend taking the time to take this walk; it's well worth it! Unfortunately we didn't find any cupcakes (though we tried mightily to find the Crumbs near Bryant Park!) and we didn't get out to Coney Island as by the time we got across the Brooklyn Bridge it was starting to get late and rumor has it Coney Island is not the place to be after dark unless you're very brave. Add on the fact we were pretty worn out and I guess that's to be done another time, too! We did do a lot, though, and I'll be doing a post on that pretty soon. For today, though, it's off the computer and spending the day with Jamie before taking her to the airport for a 5:40 flight. Hard to believe it's been over two months already since she got here and it's going to be downright strange to not have her anymore but this is something we go through every summer. You would think I would be used to it by now but apparently not. Anyhow, everyone have a great Saturday ... I'm going to give it a shot on my end in spite of what will surely be a large lump in my throat later. Sounds like fun... Oh I was "wobbly" my first few rounds of the RV park on my bike... it does take some getting used to. and your description of NY pedestrians!! Look forward to all the NY news. Tell Jamie we will miss her and to hurry back soon. In a way I'm glad that we didn't meet this time around. You had much more important things to do. Glad you enjoyed yourselves though. And I'll take a rain check! 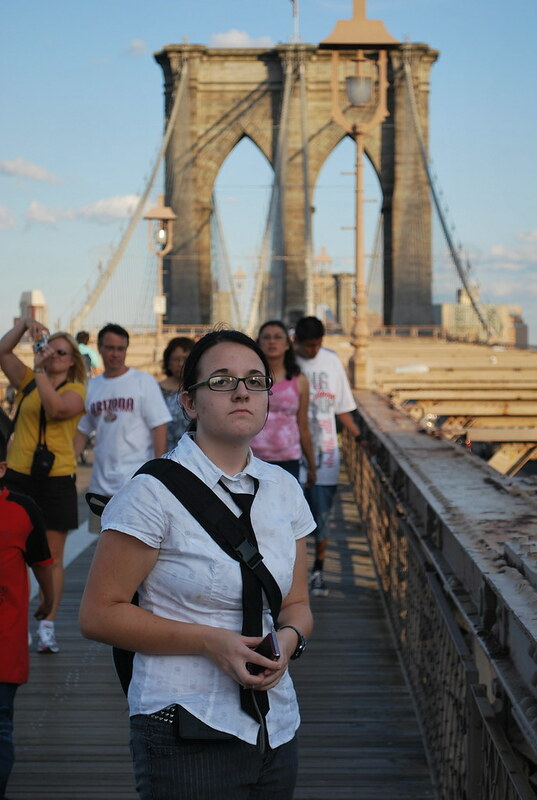 My friend would probably love to walk across the Brooklyn Bridge so that's definietly an incentive to get there soon. Good NY news and photos! Okay Linda, now what did you do differently in posting the pictures in this post than what you did last week in posting photos? I don't know but whatever, however you did it last week, the posts scrolled through smoothly and quickly. Today, this one -slow, slow, and crawling slow with hopping around too! I liked last week's method better although I did enjoy this post. Just would like it better if it scrolled through quickly and smoothly.